We've had new neighbours move into the flat adjacent to ours. A young friendly girl with a pet dog are the new occupants of that apartment. One evening, our friendly neighbour came up to Sona and me and introduced herself and her dog Kabi, whom she claimed was a therapy dog. The concept of a therapy dog was new to us and we were curious to learn more. Apparently, Dogs are great stress busters and Kabi was used to playing with cancer patients at a centre. So she volunteered to send her pet over if she could help Rizwan as well! We had several dogs as pets when the kids were younger. Rizwan had a special tacit relationship with each pet. He was shy of touching them but one could see there was a special bond between them. I remembered an incident from June's childhood. He was 7 0r 8 years old when this extremely shocking incident took place. 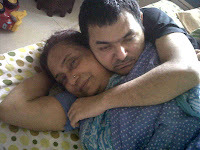 My husband and I were not home and my mother was baby sitting Rizwan. Our kitchen was in one corner of the courtyard, with an iron grill door which had a locking system from both sides to prevent Rizwan from getting in. As established in an earlier post by Sona, Rizwan loves food and cannot control his diet. Mummy was inside the kitchen, the door was latched and Rizwan was watching her from outside waiting for his Nanna to fix him some food. However, to my mother's horror, just then a monkey also came and stood next to Rizwan. My mother was dumbfounded, she didn't know what to do. The monkey was standing right next to Rizwan, so she thought it would be imprudent to scream for help, lest the animal would get agitated! However, Rizwan was unnerved, he did what he does with everyone for a physical contact - he stretched out his arm and pulled the monkey's hair! The monkey turned and stared at Rizwan, and just when my mother thought he would attack Rizwan, the monkey retreated towards the terrace instead. But it didn't end there, almost as an after thought, the monkey suddenly turned back and came up to Rizwan again, this time it was the monkey that extended its hand and kept it on Rizwan's head, then walked away again! My mother who was terrified till now, had tears in her eyes watching this spectacle. She quickly opened the door and hugged Rizwan, half relieved and half in disbelief at the bond she witnessed between our special child and an unpredictable animal.